The beginning was not so long time ago -just in year 2001. At those times Sergey who was then playing guitar at Butchers(brutal death) and Victor (guitars), founder of Disgorged (not less brutal music as Butchers), felt that there is some need for changes. As a result new band called FLAYING emerged. Karlis (Preternatural) was invited for bass. Growling was trusted to famed Ruslan, who was already well known from his other projects (out of which the most recognizable - Sanctimony). Still, for the full-blooded gang one person was missing, so finally guys "installed" Evgenij (Preternatural) by drums. Taking into account newly created band's participants' musical taste, namely Dying Fetus, Cryptopsy, Suffocation and many other similar "brutal/rough" projects, new band's musical direction was chosen rather fast... Brutal death/grind and no step aside! Thus the band has successfully taken its niche in Latvian underground music. Year 2002 is characterized by the fact that FLAYING started giving its gigs. 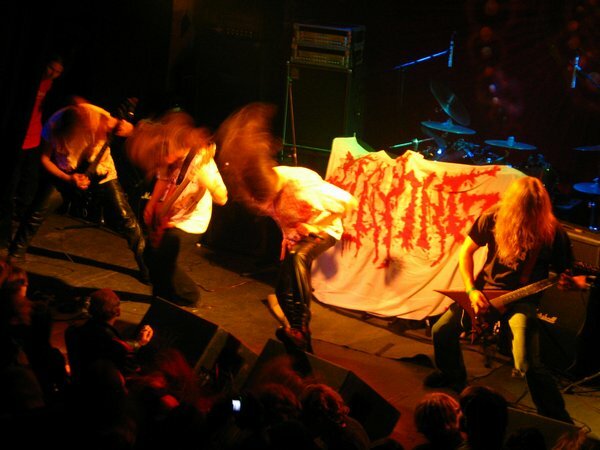 Additionally to participation in tons of local shows, in the short time of the band's existence it has also played together with such headliners as Impaled Nazarene, Count De Nocte, Sanatorium, Vader, Dismember. Everything was ok, till the moment when Sergey left the band. Afterwards, in August, 2004 also Ruslan decided to withdraw. The remaining musicians did not set aside their hard work reached by "flooding hands in the blood" and welcomed new flesh in their union - Viesturs, famous from Sanctimony (guitar) and previously un-known Janis (vocals). Taking into account the newcomers, the band is still "sharpening" and finalizing its musical material to reach the best sound. With the new make-up, the group has preformed with Cannibal Corpse, Spawn of Possession, Devilyn, Neolith, the Finnish grinders Rotten Sound, and also has played in several local concerts. In between concerts, the group finally entered the studio on 22 February 2005, where they recorded an album with 10 songs. The summer of 2005 began with FLAYING’s participation in the two biggest open air festivals in the Baltics - Estonia’s “Hard Rock Laager”, sharing the stage with Katatonia, Lord Belial, Darzamat and more Estonian bands and Latvian “Metalshow open air”. In the end of 2005 FLAYING go to Vilnius, Lithuania as support for Vital Remains, Resurrecturis gig. FLAYING has been looking for a potential record label and found it in the beginning of 2006. A deal has been made with the Czech label, Epidemie records. 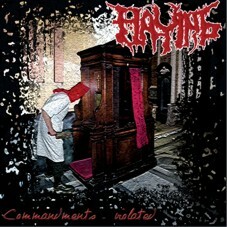 The debut album, „Commandments - violated” has been released in may of 2006. 10 nails of extremely technical and brutal death/grind metal, inspired by Dying Fetus, Suffocation, and Cannibal Corpse.